Here’s a great coupon. 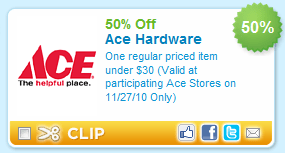 Get 50&% off the price of any one regular priced item under $30.00 at ACE Hardware. Coupon valid November 27, 2010 only.